Quilt Show Reno is proud to offer new & exciting free presentations for all show attendees from the Main Stage throughout the show. 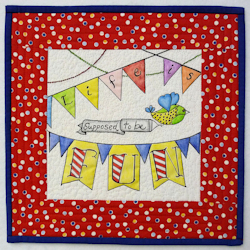 Plan now to spend some time at the Main Stage learning the latest in quilting/sewing tips and techniques at the feet of the experts for FREE! 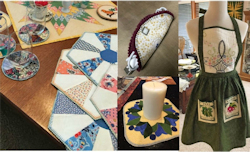 Check out all the amazing things you can create using vintage and new items that have been passed down through a family member or items that you have collected through the years. 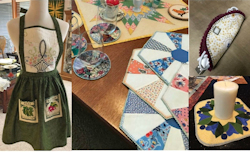 I will show you what to do with old china, cross-stitch pieces, damaged embroidery linen, candlesticks, quilts in poor condition, small knickknacks’, orphan or vintage quilt pieces, small tin molds old wool blankets etc. Come and check out the darling pincushions, journal covers, sewing caddie, table runners and more. You don’t need vintage items these items can easily be done with newer pieces. Join elinor on a creative journey through the doll making and creative process. She will share her samples and explanations of how the creative process took place. This is an interactive conversation on what, why and how she is inspired to create one of a kind art pieces that have personal meaning in her life. 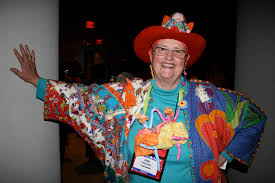 elinor is an international speaker, teacher, dollmaker and creator of all kinds of textile art, including- Clothing, Quilts, Dollmaking and Mixed Media Art. elinor has been traveling worldwide for the past 35 years to share her expertise and knowledge in the Quilting industry. 12:30 pm Great Gifts to Give! If you’re like me, you’re always on the hunt for new projects. I love sharing new projects with others so I want things that are quick & easy. But more than anything, I want projects that others would actually want to receive! Come join me, Linda Winner from Martelli, as I open up my suitcase and show you LOTS of projects that I can promise others will want. I’ll give you tips & techniques to make them quick & easy but won’t disappoint. You’ll see projects for baby and kids, the kitchen and home, technology and great accessories, ideas to pamper others and much more. If gift giving is your thing, I promise you’ll be getting requests for more! Can you piece 200 pieces of fabric in less than an hour? Yes!!! It is more than a ruler ~ it is an inspiration and motivator for so many projects ~ table runners, quick quilt borders, placemats, Christmas Tree skirts, center pieces, little girl’s skirts, coasters and even a quick method in putting together a sweatshirt jacket! You will love the ideas and the quick and easy versatility when using this ruler. Need projects? Look no further! Beginners are welcome! A demonstration using an Eclipse 20 Quilting Machine, HD Camera, and a Computer Projector. 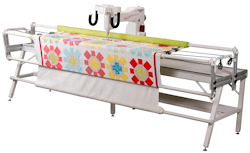 We will cover simple things the Quilter should do to keep their machine running smoothly. In addition, we will cover some troubleshooting and when to call a Service Technician. Learn how to use delicate, decorative and metallic threads without them twisting and breaking. Success can be achieved without tearing your hair out. Proper tools, needles and machine settings will be taught so you can create that WOW factor with ease. 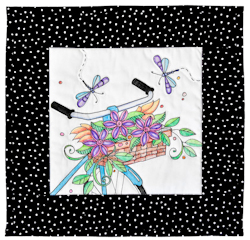 Colored pencil can be made permanent on your fabric to create fun, easy quilts. Come learn the secrets and unleash your inner child. 1:30 pm Make that Bag Your Own! Making unique Purses and Bags is easy using hardware that is both decorative functional. We will explore lots of options from the sophisticated to the funky, so you can add your own personal touch to portable storage projects. It’s not just for your microwave anymore! As a bonus, Linda will show how to make a better Coffee Cozy, too! 10:30 am Great Gifts to Give! 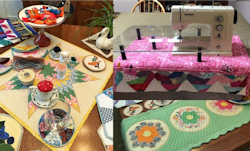 Making and finishing a project is always fun and after 40 years of sewing, we have figured out more than a few shortcuts and helpful methods for making things easier and faster. Discover invaluable techniques as Connie shares her best-loved tricks for finishing your projects. You will take that last stitch sooner, and have more fun along the way. Bonus: A collection of quick gift ideas that will be fun and easy to finish.